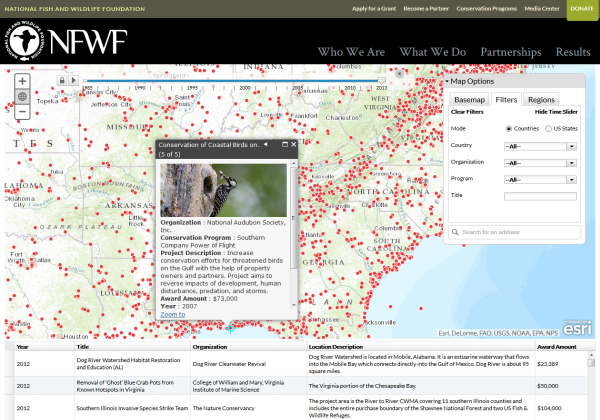 To see the map in action and explore the years of conservation work supported by NFWF, go to http://nfwf.org/whatwedo/map/Pages/map.aspx. The National Fish and Wildlife Foundation (NFWF) is a Congressionally-chartered foundation, specifically charged with the administration of monies to “further the conservation and management of fish, wildlife, plants, and other natural resources” of the United States (National Fish and Wildlife Foundation Establishment Act, 16 U.S.C. §3701 et seq.). Since 1984, NFWF has become one of the world’s largest conservation grant-makers with more than 12,100 grants totaling over $2.1 billion.